award. | everything will turn out alright. ← things that annoy me. today i received my very first blog award. thanks, GRETCHEN! 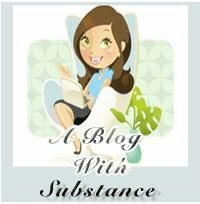 as the recipient of the blog with substance award, i am supposed to share 5 words that sum up my blog philosophy/motivation. i am also supposed to pass this award onto 10 other bloggers with substance. like gretchen, i am going to cheat a little and pass this award onto 3 exceptionally substantial bloggers. i’m going to take it easy for the rest of the evening. today we sorted laundry, ran a bunch of errands, and hung sylvie’s mobile (pictures coming soon)! i’m about spent. i hope everyone has a fantastic evening. happy wednesday! This entry was posted in Uncategorized and tagged blog award, nursery, sylvie. Bookmark the permalink. just found your blog and i’m already hooked! adding you to my reader. btw, love the illustrations…very inspiring. when my friend’s baby is born, I will be plcing an order.